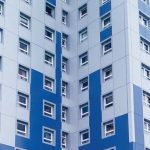 One of our earliest projects circa 1990 was the overcladding of the once derelict Hyde Park Flats, Sheffield, – Block A (renamed Castle Court). Overcladding was a relatively new concept at that time. Sheffield Building Control initially rejected our designs because of concerns regarding fire spread. We employed Arup Fire Engineers to process a DOT Determination and subsequently obtained statutory approval for the design. Several years after completion in circa 1997, a severe fire broke out on one of the deck access ways. We were called back to investigate the fire along with Arup, the Fire Officer and Building Control. The reports concluded that the fire was severe, was fully contained, did not spread beyond its ‘compartment’ and that the cladding performed in accordance with approved Document B. The Sheffield Building Control Office in 1990 had little experience of dealing with construction of this type and the approval of the overcladding with respect to section B2—Internal fire spread (linings), B3 (2)—Internal fire spread (structure) and B4 (1)—External fire spread was referred to the Secretary of State for the Environment for determination. In his letter of 28 February 1991 and after due consideration the Secretary of State approved the details put forward for meeting the requirements saying. . . “In all the circumstances the Secretary of State determines that the proposals comply with the requirements of Regulations B2/3/4 of Schedule 1 to the Building Regulations 1985”. thereby providing empirical evidence of the system’s fire performance. The d+b facades system and service has been in use for 27 years being designed, manufactured and installed by the same core UK-based team from the outset. We offer a specialist design and build (d+b) service where possible taking full and single point responsibility for the system, the materials, the installation and the existing structure. We know no other way to operate effectively in the highly complex and specialist field of overcladding.